Romantique Limos provides outstanding wedding and prom limousine service with luxury and exotic stretch limousines, SUVs & Rolls Royce limousines for your special day. Romantique Limousines understands the significance of your wedding day running smoothly after months of planning. That's why you can count on DoubleDiamond Limousines to arrive on time, and our courteous chauffeurs are always helpful and attentive to your needs and wishes. We service the New York and New Jersey metropolitan areas. While riding in our luxury limousines, students, Moms, Dads and relatives can rest assured that safety and timeliness is our first concern. All DoubleDiamond Limousines drivers carry cellular phones on them at all times. Our luxurious fleet comes equipped with fire extinguishers and first aid kits on board. DoubleDiamond Limousines always puts your safety first. Spend your prom night with us and have a formal event with style. Imagine arriving to your special occasion in a Hummer limousine, Jaguar limousine or a Cadillac Deville. Our professional chauffeurs will attend to your every need. 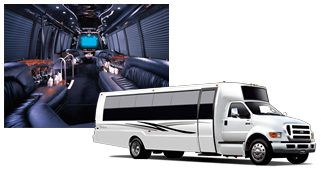 Whether it's a Bachelor or Bachelorette party, prom or just a night on the town, your driver will treat you like family!